Undercover Vid Reveals Sen McCaskill is No Moderate, Hiding Agenda From Voters, "People Just Can't Know"
Sen Claire McCaskill. Although many assume she tells voters what they want to hear, this video confirms she and her staff are doing everything possible to deceive voters, especially republicans, that she’s a moderate on big issues, such as gun control. It’s revealed many of her staff (volunteers) are part of gun grabber Michael Bloomberg’s Moms Demand. 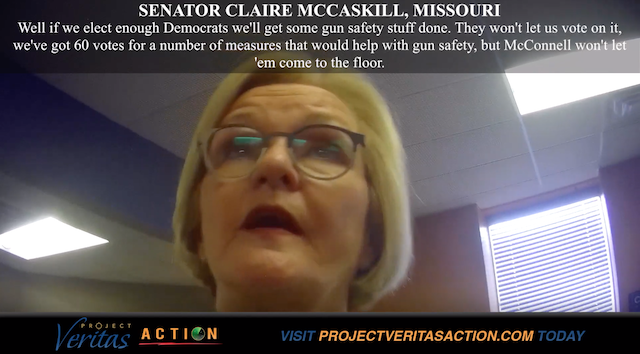 McCaskill is on board with them and their agenda but is doing it under the radar so pro-Second Amendment voters won’t find out. AS it’s explained in the video she is more or less keeping her name off anything even remotely connected to the group. McCaskill is no moderate, she has the same policies as obama, once in office she’ll move on everything she tells voters she opposes. Democrats are going overboard this election doing whatever it takes to get elected/ re-elected. They’re selling themselves like moderates, as McCaskill is doing, but once in office they’ll stab voters in the back. And the response her people will have for who are mad over the change in policies like impeaching Trump, ‘Get over it’. The democrats are beyond deceitful, but more importantly dangerous. These people need to face an electoral extermination this November. Vote out the democrats or you will get the govt you deserve.